Can the Super Bowl champions New England Patriots kick off the defence of their crown with a win over the Kansas City Chiefs. Claim a 33/1 boost on NE Patriots to beat KC Chiefs at Coral + £5 free bet should you lose! Bookmakers are expecting another successfull season for the Patriots, orchestrating by the Brady and Belichick duo, and it's not a surprise to see New England 2/9 favoruites to win the NFL season opening match. Wanna a bigger price? Don't miss this massive 33/1 New England Patriots to beat Kansas City Chiefs at Coral! Huge bargain! Join Coral before the kick-off on Friday (1.30am) for 33/1 New England Patriots to beat Kansas City Chiefs instead of 11/5!! Make your first deposit of £5 or more and your enhanced odds will appear on home page - 33/1 NE Patriots to win vs KC Chiefs! Coral are offering all our readers an tasty 33/1 for New England Patriots to beat the Chiefs (was 2/9), click this link to get the price boost in less than 30 seconds! Open a new Coral online or mobile account and bet on NE Patriots to beat KC Chiefs - 33/1. 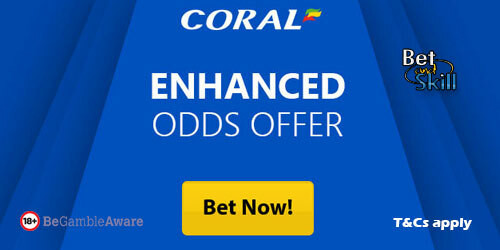 Offer available to UK & Republic of Ireland residents aged 18 years or over opening a new Online, Mobile or Coral Connect account in either £/€ currency through https://promotions.coral.co.uk/landing-pages/crazy-prices, https://promotions.coral.co.uk/landing-pages/crazy-prices-online, or the specific offer promotion box from coral.co.uk/sports/offers between 08:00 BST Tuesday 5th September until 01:30 Friday 8th September with the exception of new accounts depositing funds with Moneybookers, Paysafe, Neteller or Skrill. Place your FIRST real money bet as a win single £/€1 on ‘Patriots to win 33/1’ in our “My Markets” sections. "Coral offer 33/1 Patriots to beat Chiefs + £5 free bet (NFL Price boost)"